The period from February 1 to 11, is celebrated every year in Iran as the “Decade of Fajr.” February 11 is the “Islamic Revolution’s Victory Day”, a national holiday with state sponsored demonstrations in every city. The Iranian Revolution also known as the Islamic Revolution or 1979 Revolution, (Persian: انقلاب اسلامی, Enghelābe Eslāmi) was the event that overthrew Iran’s monarchy, the Pahlavi Dynasty under Shah Mohammad Reza Pahlavi) as it was replaced by the Islamic republic under Ayatolah Ruhollah Khomeini. 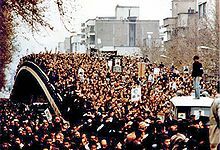 The demonstrations against the Shah started already in January 1978 as it continued until December. The Shah did not see any other solution but to leave for exile in mid January 1979 before Ayatollah Khomeini returned to Teheran. The royal monarchy collapsed shortly after on February 11 when rebel troops overwhelmed troops that stayed loyal to the Shah in an armed street fight. On April 1, 1979, the Iranians voted by national referendum to become an Islamic State and Khomeini became the Supreme Leader of the country on December 1979. The revolution started as being a populist and nationalist revolution and later became Shi’a Islamic. It was against the Westernizing and secularism efforts of the Western supported Shah and as the Iranians claimed, a puppet of the United States whose culture was impacting on Iran. The Shah’s regime was also known as being oppressive, brutal, corrupt and very extravagant that brought shortages and inflation to the country. 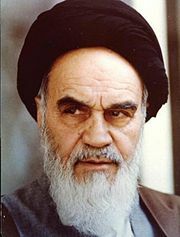 The leader of the Iranian revolution and Shi’a cleric Ayatollah Ruhollah Khomeini first came to political prominence in 1963 when he led opposition to the Shah and his “White Revolution”, a program of reforms to break up landholdings (including those owned by religious foundations) and allow religious minorities to hold government office. This led to the arrest of Khomeini in 1963 after he declared that the Shah was a “wretched miserable man who had embarked on the destruction of Iran.” He had preached that revolt and martyrdom against injustice and tyranny was a part of Shi’a Islam. 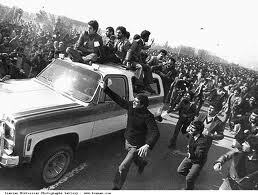 Three days of major riots followed throughout Iran as 15,000 supporters of Khomeini died in police fire. Khomeini was later released after 8 months of house arrest and continued on condemning the regime’s close cooperation with Israel and USA. In November 1964, Khomeini was re-arrested and sent into exile where he remained for 14 years until the revolution day. Away from Iran, Khomeini developed the ideology of velayat-e faqih (guardianship of the jurist) as government, that Muslims (in fact everyone) required a “guardianship,” in the form of rule or supervision by the leading Islamic jurist or jurists. Such rule was even “more necessary than prayer and fasting” in Islam, as it would protect Islam from deviation from traditional Sharia law, and in so doing eliminate poverty, injustice, and the “plundering” of Muslim land by foreign non-believers. This ideology, spread through his book Islamic Government, mosque sermons, smuggled cassette speeches by Khomeini and his network consisting of students and traditional business leaders. The first militant anti Shah demonstrations happened in October 1977, after the death of Khomeini’s son Mostafa. The protesters were a few hundred but increased into several thousands. In January 1978, the army was sent into Qom were religious leaders and students were demonstrating. The protests ended with the death of many students. The cycle repeated itself, and on March 29, protests began across the nation. Luxury hotels, cinemas, banks, government offices, and other symbols of the Shah regime were destroyed; again security forces intervened, killing many. On May 10 the same occurred. Security forces were unable to deal with protests and demonstrations and the large size of anti Shah Movement showed that there were “too many to arrest,” overwhelming the security forces. A new prime minister, Jafar Sharif-Emami, was installed in late August and reversed some of the Shah’s policies. Casinos were closed, the imperial calendar abolished, activity by political parties legalized — to no avail. By September, the nation was rapidly destabilizing, and major protests were becoming a regular occurrence. The Shah introduced martial law, and banned all demonstrations but on September 8 thousands of protesters gathered in Tehran. Security forces shot and killed dozens, in what became known as Black Friday. By December 1978, Shah’s position had deteriorated so much that soon he would “only be allowed to stay in Iran,” and he was turned by the opposition. 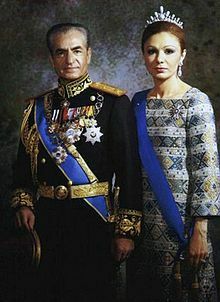 On January 16, 1979, the Shah and the empress left Iran. Scenes of joy followed and within hours, the Pahlavi Dynasty was destroyed. Bakhtiar dissolved SAVAK, freed political prisoners, ordered the army to allow mass demonstrations, and promised free elections and invited Khomeinists and other revolutionaries into a government of “national unity”. After stalling for a few days Bakhtiar allowed Ayatollah Khomeini to return to Iran, asking him to create a Vatican-like state in Qom and calling upon the opposition to help preserve the constitution. Khomeini appointed his own competing interim Prime Minister Mehdi Bazargan on February 4, ‘with the support of the nation’ and commanded Iranians to obey Bazargan as a religious duty. “Through the guardianship (Velayat) that I have from the Holy Lawgiver, I hereby pronounce Bazargan as the Ruler, and since I have appointed him, he must be obeyed. The nation must obey him. This is not an ordinary government. It is a government based on the Sharia. Opposing this government means opposing the Sharia of Islam. Revolt against God’s government is a revolt against God. Revolt against God is blasphemy. As Khomeini’s movement gained power, soldiers began to defect to his side. On February 9, a fight broke out between loyal Immortal Guards and the pro-Khomeini rebel Homafaran element of the Iranian Air Force, with Khomeini declaring jihad on loyal soldiers who did not surrender. Revolutionaries and rebel soldiers gained the upper hand and began to take over police stations and military installations, distributing arms to the public. 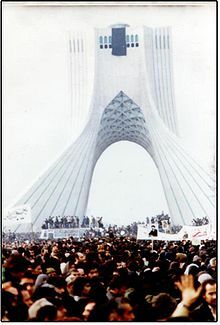 The final collapse of the provisional non-Islamist government came at February 11 when the Supreme Military Council declared itself “neutral in the current political disputes… in order to prevent further disorder and bloodshed.” Revolutionaries took over government buildings, TV and Radio stations, and palaces of Pahlavi dynasty. March 30 and 31, 1979, a referendum to replace the monarchy with an Islamic Republic passed through with 98% votes in favour of the replacement. Bells rang out from schools, trains and boats at 9.33am, the moment Khomeini’s aircraft touched down on February 1, 1979, on his return from exile in Paris, France. After living in exile for almost 15 years Ayatollah Khomeini returned back to Iran where he was met by 5 million people lined in the streets of the Nation’s capital Teheran, to witness his homecoming. Ayatollah Ruhollah Khomeini, 78, was imprisoned by the Shah in 1963 for his opposition to reforms and for criticizing the Shah Mohammad Reza Pahlavi for his westernization and the ties with USA and Israel. The year after in 1964 he was expelled out to Iraq through Turkey. 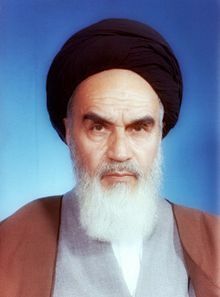 While Khomeini was in exile in France, he formed an opposition against the Shah as he called for general strikes, turning the people against the government and coordinating the revolution. Khomeini had for long insisted that he would not return back to Iran unless the Shah would leave, and indeed the Shah did left on January 17 1979 on vacation but never returned back again. In the plane back to Iran, the ABC News reporter Peter Jennings asked Khomeini:”What do you feel in returning back to Iran?” Khomeini answered “hitch”, meaning nothing. 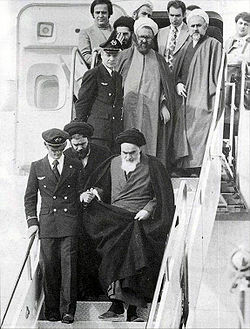 On his arrival on board on Air France jet, Khomeini then 76, vowed to establish a new government in Iran. Ayatollah, meaning the Sign of God, emerged out from the airplane looking tired as he was welcomed by 1,500 religious and political leaders that were allowed inside the terminal building. The police force that consisted of 50,000, quickly lost control over the heavy crowd outside the airport who had came to get a glimpse of the Ayatollah. They were shouting his name as their hands were raised in greeting and appreciation while the car Ayatollah was sitting in made a slow progress in driving. From the airport, Khomeini travelled to the nearby cemetery called Behesht Zahra cemetery where many martyrs of the revolution lay buried as millions of his supporters cheered his name and hundreds of thousands gathered at the cemetery to speak to him. Here he said:”I must tell you that Mohammad Reza Pahlavi, that evil traitor, has gone. We are saying this man, his government, his government is all illegal. If they were to continue to stay in power, we would treat them as criminals and would try them as criminals,” Khomeini declared. “I shall appoint my own government. I shall slap this government in the mouth. I shall determine the government with the backing of this nation, because this nation accepts me. ” he said addressing to the 250 000 followers inside the cemetery. The Prime Minister then who was in charge after when the Shah fled, Shahpur Bakhtiar, responded to this by saying; “Don’t worry about this kind of speech. That is Khomeini. He is free to speak but he is not free to act.” Shortly after, Khomeini appointed his own prime minister, Mehdi Bazargan, and public revolts spread throughout the country. Weakened by the uprisings, Bakhtiar’s government collapsed on February 11, 1979 when the military declared itself neutral, allowing the revolutionaries to take control. March 30 and 31, 1979, a referendum to replace the monarchy with an Islamic Republic passed through with 98% votes in favour of the replacement with the question: Should the monarchy be abolished in favour of an Islamic Government? Born in September 22, 1902, Khomeini was an Iranian religious leader and politician as well as being the head leader of the revolution in 1979 which resulted in the overthrowing the Shah of Iran. Khomeini was described as “slim,” but athletic and “heavily boned.” He was known for his punctuality: ”He’s so punctual that if he doesn’t turn up for lunch at exactly ten past everyone will get worried, because his work is regulated in such a way that he turned up for lunch at exactly that time every day. He goes to bed exactly on time. He eats exactly on time. And he wakes up exactly on time. He changes his cloak every time he comes back from the mosque.” Khomeini was also known for his aloofness and stern demeanor. He is said to have had “variously inspired admiration, awe, and fear from those around him. His practice of moving “through the halls of the madrasas never smiling at anybody or anything; his practice of ignoring his audience while he taught, contributed to his charisma. In November 1979, the new constitution of the Islamic Republic was adopted by National referendum and Khomeini himself became the country’s supreme leader, a position that was created in the constitution as the highest ranking both political and religious authority over the Nation until his death. On February 4th 1980, Abolhassan Banisadr was elected as the first President of Iran. In the Muslim world abroad, he was described as the “virtual face in Western popular culture of Islam, known for his support of the hostage takers during the Iranian hostage crises when students stormed the US embassy in Teheran in November 1979 and took hostages for 444 days as they wanted Washington to sever ties with the Islamic republic, and the fatwa, calling for death of British citizen Salman Rushdie. During his conservative rule, Iran became embroiled in a debilitating conflict with neighboring Iraq, then under Saddam Hussein’s rule and over a million people were killed on both sides during the eight-year long war. After eleven days in a hospital for an operation to stop internal bleeding, Khomeini died of a heart attack Saturday 3rd of June 1989, 22:22 hrs local time, at the age of 88. Iranians poured out into the cities and streets to mourn Khomeini’s death in a “completely spontaneous outpouring of grief. Despite the hundred-degree heat, crushing mobs created an impassable sea of black for miles as they wailed, chanted and rhythmically beat themselves in anguish. As the hours passed, fire trucks had to be brought in to spray water on the crowd to provide relief from the heat, while helicopters were flown in to ferry the eight killed and more than four hundred injured. Two million people attended his funeral. Iranian officials aborted Khomeini’s first funeral, after a large crowd stormed the funeral procession, nearly destroying Khomeini’s wooden coffin in order to get a last glimpse of his body. At one point, Khomeini’s body almost fell to the ground, as the crowd attempted to grab pieces of the shroud. The second funeral was held under much tighter security as Khomeini’s casket was made of steel, and heavily armed security personnel surrounded it. In accordance with Islamic tradition, the casket was only to carry the body to the burial site.